Smartphones have many functions. We have talked about four functions in the previous articles (display, camera, audio and touch). This time around, we introduce Wi-Fi testing for smartphones. 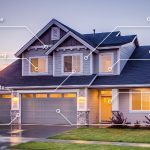 In Wi-Fi testing, we test in the laboratory and in simulated real-world environments, such as office and home. By testing in different environments, our tests results will more closely resemble consumer behavior. 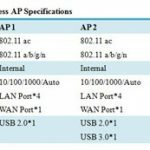 In real-world environments, wireless APs and client devices are placed in different configurations. The distances between the wireless APs and client devices will affect wireless signal strength, due to signal attenuation and interference effects, which directly affects wireless transmission performance. Furthermore, different combination of 802.11 wireless channels and mode settings can also affect signal throughput. With in-depth test methods, Allion can provide reference data to our clients and give suggestions for antenna design or firmware adjustment. We recently conducted the following smartphone wireless tests. We used attenuators to attenuate wireless AP signals to simulate different distances between smartphones and wireless test equipment. Meanwhile, we also needed to examine Wi-Fi transmission performance at different distances. In the same wireless mode, we used different channels to test transmission performance. Allion used three channels (high, medium, and low) to conduct the test. For example, we used channels 1, 6 and 11 for 2.4 GHz testing and channel 64, 149, 161 for 5 GHz testing. In the figure below, the X-axis represents different attenuation values while the Y-axis represents wireless transmission strength. On channel 1, Phone 1 lost signal at -50 dB, while the other two phones lost their signal at -60 dB. This indicates that Phone 1 has a shorter maximum transmission distance. Moreover, Phone 2 showed similar performance with Phone 3 on channels 1 and 6, but it showed poor performance on channel 11. 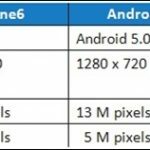 By this testing, we can better understand smartphone performance and differences across different channels. 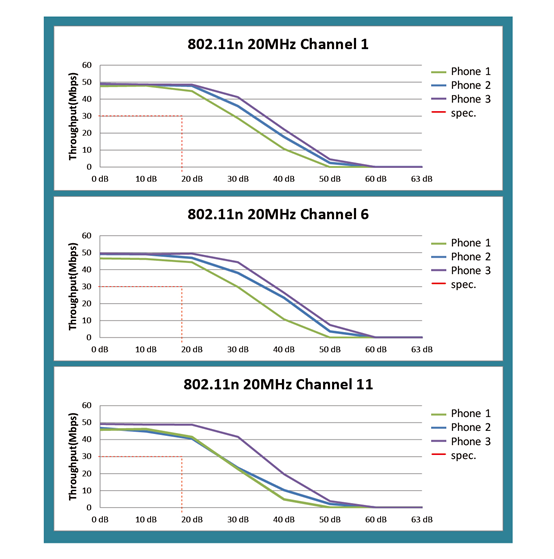 For 802.11 mode sweep testing, we tested smartphones on a fixed channel with different wireless protocols. Based on different wireless frequencies, we used corresponding wireless protocols for testing. For example, 2.4 GHz corresponds to 802.11 b/g mixed mode, 802.11b/g/n + 20 MHz (bandwidth), and 802.11 b/g/n + 40 MHz (bandwidth). 5 GHz uses 802.11 a/n + 20MHz (bandwidth), 802.11 a/n + 40 MHz (bandwidth), and 802.11 ac + 80 MHz (bandwidth). 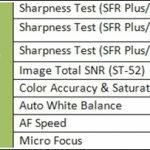 This testing can help us to understand smartphone performance under different wireless protocols. 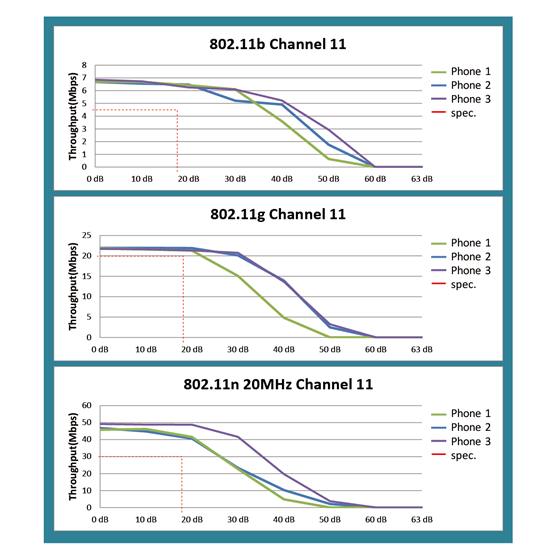 The figure below is an example of different 802.11 modes on channel 11. In this figure, the X-axis represents different attenuation values and the Y-axis represents wireless transmission performance. In the same channel, Phone 3 performance is obviously better than the other phones because it has a longer transmission distance along the X-axis. The antenna design of products also affects transmission performance. 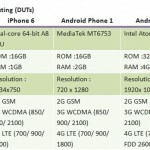 Allion tested smartphones at different angles (45° increments) around a wireless AP. Our test engineers determined which angles showed the weakest performance and then used that information as a reference point for antenna design recommendations. For this test, it is good for the wireless signal strength to be identical in every angle meaning that wireless transmission performance is not affected by AP location or smartphone orientation. 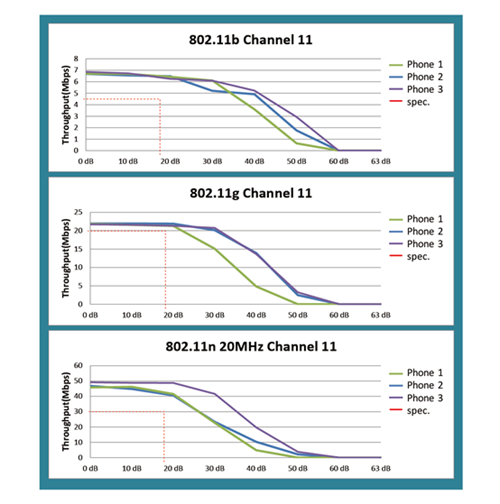 The figure below shows wireless transmission performance in different channels of 802.11n 5 GHz mode. Looking at the test results for channel 161 (on the right); you can see that Phone 1 and Phone 2 have good coverage in every angle. Meanwhile, Phone 3 has consistently weaker signal reception than the competition and the signal pattern is not symmetrical, meaning that signal strength varies by the angle of orientation. Our Wi-Fi testing helps customers understand the performance of smartphones in different Wi-Fi modes, channels, and angles. 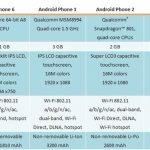 Our customers use this information to improve their smartphone designs. Allion has Wi-Fi experts on staff who can follow-up with smartphone debugging assistance and product design consultation. Allion can also provide a golden sample for product comparison. Finally, we also offer total design packages with OEM/ODM quality control oversight, competitive analysis, and marketing assistance. Please consider Allion for your next smartphone project.